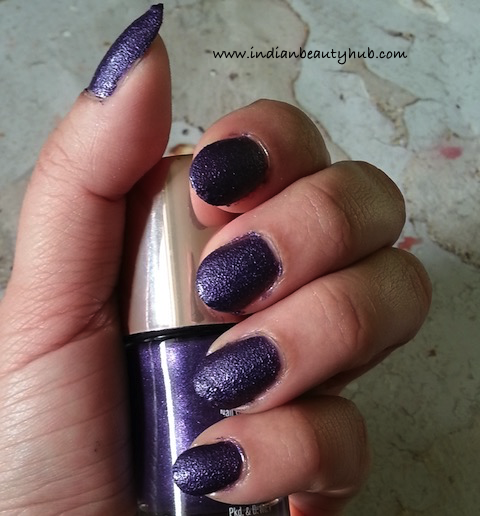 Hey everyone, today I’m reviewing the Lakme 9-to-5 Frosties Nail Enamel in shade Purple Frost. Lakme launched this new textured nail paint range a few months back. Lakme 9 to 5 Frosties nail enamels are available in 5 pretty shades – Red Frost, Peach Frost, Pink Frost, Mauve Frost, Purple Frost. 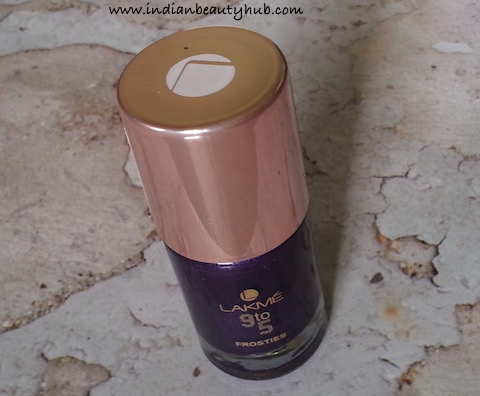 Packaging : Lakme 9 to 5 Frosties Purple Frost Nail Enamel comes in a cylindrical glass bottle with a broad, rose gold metallic cap. A flat brush applicator is attached with the cap which makes the application easy and fuss-free. The brush is of good quality and you need just three strokes to cover a full nail. The shade is given at the bottom of the bottle. Texture : The nail paint has a perfect consistency, neither too thick nor runny. It contains a loads of sand like particles which give the frosty look to the nail paint. 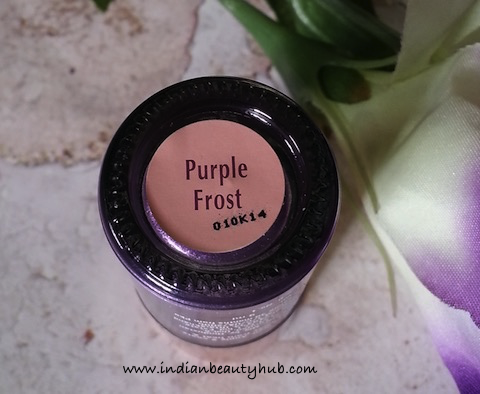 Shade & Pigmentation : The shade Purple Frost is a pretty purple color with blue undertones. It is very pigmented and goes opaque with just one stroke and 2 coat are good enough for that rich textured finish on the nails. Staying Time : It dries fast and gives matte frost finish to the nails. It stays on the nails for 5-6 days without chipping or fading. 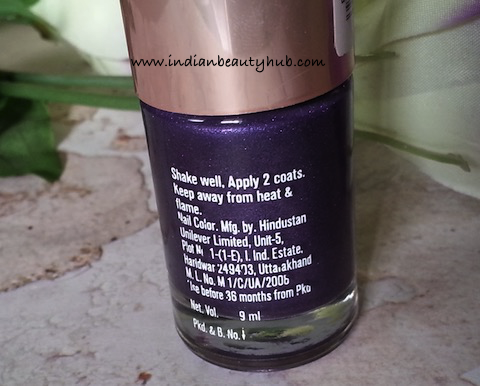 Price & Availability : The price of the Lakme 9-to-5 Frosties Nail Enamels is Rs.200 for 9ml. 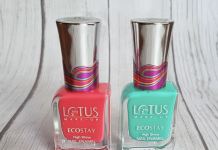 These nail paints are easily available at Lakme counters across India. Broad brush makes application easy and fast. Pretty purple shade, will look good on all skin complexions. It doesn’t contains shimmer and gives matte textured look to the nails. Stays on nails for long. 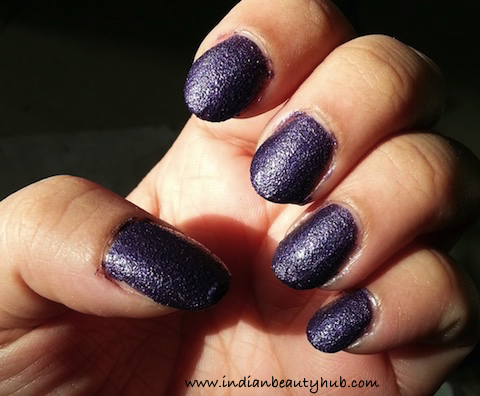 Lakme 9 to 5 Frosties Purple Frost Nail Enamel gives a pretty textured finish to the nails. It comes without shimmer and stays on the nails for long. 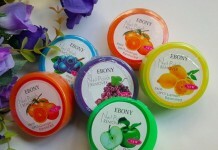 Its textured formula makes it a worth trying, at-least 1 shade from this range.